So it’s April 2014 which seems as good a time as any to share my 2013 music listening charts. 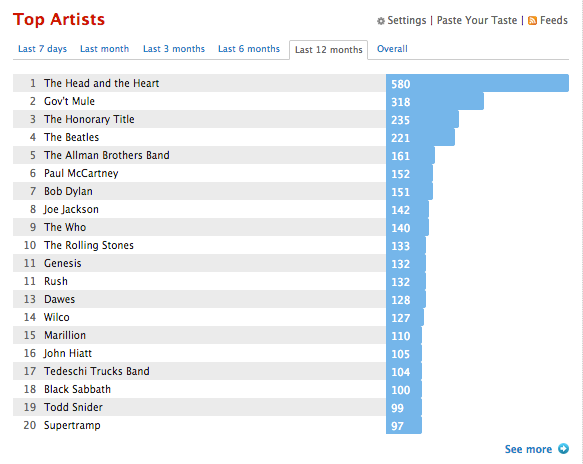 I use the wonderful last.fm web site and service to track my listening. It is probably pretty accurate as the bulk of my listening is done through my computer and thus recorded. What is lacking would be the stuff I listen to in the car but honestly I think that represents such a small amount of my listening time that it wouldn’t impact this in any substantial fashion. Also notable I think is the inclusion of The Honorary Title on the artist list. Their Anything Else But The Truth release is just astounding. Otherwise, I don’t see many surprises on my list. If you want to keep up with my listening in real time you can do so by visiting my last.fm profile. Have to check into The Head and the Heart. Cool accounting for your listening. Best! E.
I love being able to track my listening this way, it’s music and stats and stats about music – how much better could it get? 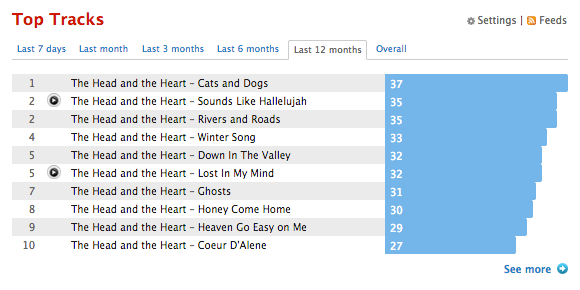 Do check out The Head and the Heart – I’m obviously a big fan.